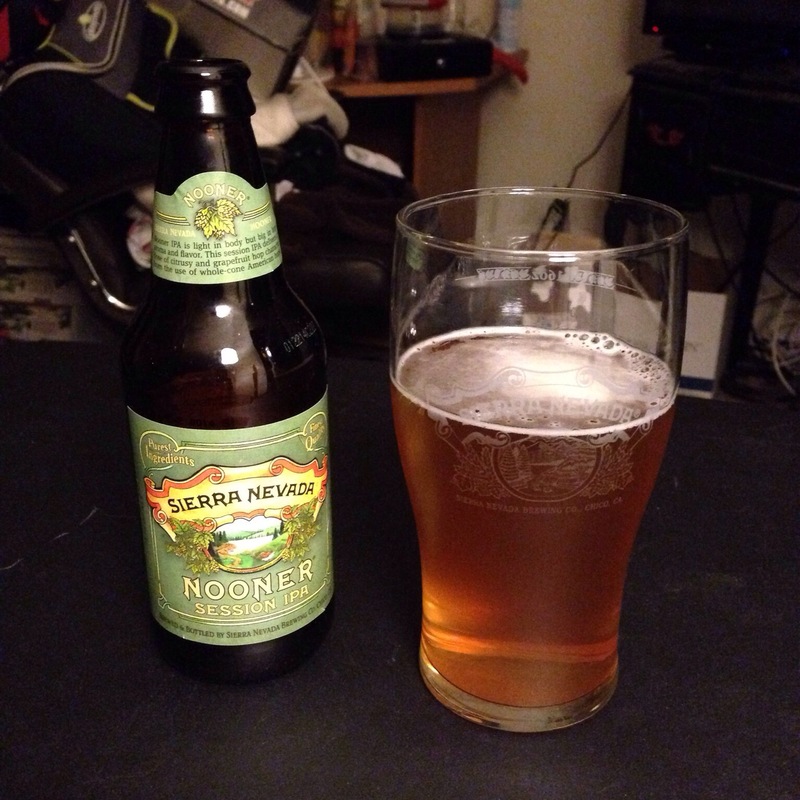 A bottle of Sierra Nevada Nooner Session IPA is on display next to a glass of the ale. Last month, Sierra Nevada Brewing Co. released a variety pack called “4-Way IPA.” A co-worker and I agreed to split a 12-bottle case from the Chico brewery that included Blindfold Black IPA, Nooner Session IPA, Snow Wit White IPA, as well as the ever-popular Torpedo Extra IPA. To make the math of dividing the case easier (and to accommodate my co-worker’s beer aficionado significant other), I opted for a bottle each of the new varieties and three bottles of Torpedo. First up for me was the Nooner Session IPA. This bottle was packaged Jan. 22, 2014 and I opened it March 11, 2014. With an ABV of 4.8 percent, this definitely seemed to be in line for casual consumption. 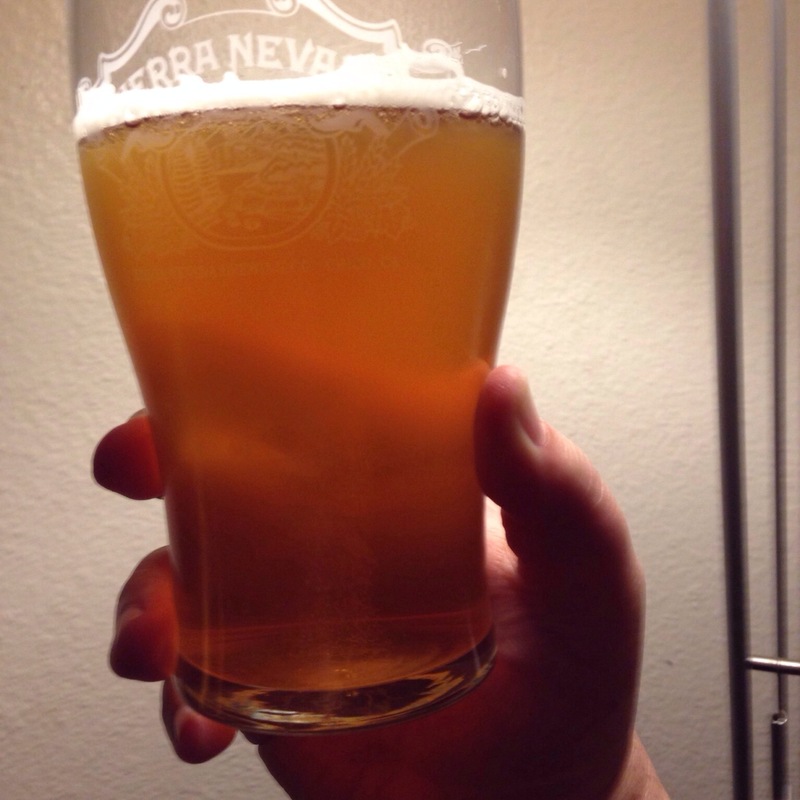 Sierra Nevada Nooner Session IPA looks amber and coppery when it is held to the light. The pour didn’t give off a lot of head. This is probably an ale that would benefit from pouring directly in to the center of the glass instead of partially down the side. The golden copper hue appeared to become cloudier as it rested in the glass. Initially, the ale’s smell was a pungent combination of citrus and pine, but it seemed to have diminished as time passed. Later, there were times I could smell it clearly and times where there was nothing. On the first sip, it seems to open like Torpedo but the finish veers in a different direction. A citrus tang lingers on the palate. Through the cymbal crash of citrus, a faint bitterness reverberates like the waning echo of a tympani. What little precious foam this beer did produce clung to the side of the glass in a satisfying fashion, but there weren’t any glorious rings. This ale packs a lot of diverse flavor, but it isn’t heavy or overwhelming. There was no point where drinking it felt like an endurance challenge to survive an onslaught of hops or other factors. Nooner Session IPA seems to live up to its name. Although I only have one bottle, I can easily picture sharing some with friends over a BBQ. I’ll sample my two remaining new ales over the next couple of days. I’ll be saving the Snow Wit for last because I’ve heard good things about it and I love saving the best for last. This entry was posted in Food & Drink, La vida Chico, World at large and tagged beer, Chico, food, Sierra Nevada, taste test by RTOlson. Bookmark the permalink.